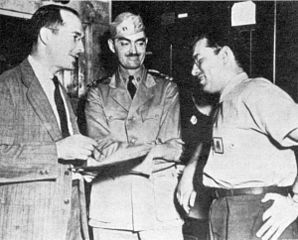 Robert Heinlein, L. Sprague de Camp, and Isaac Asimov, Philadelphia Navy Yard, 1944. Heinlein and Asimov were two of The Big Three. Who was the third? Last weekend, Vox Day set out to score a point for Infogalactic over the Wikipedia. Infogalactic is the rival online encyclopedia Day launched in October. …And finally, another example of how Infogalactic is fundamentally more accurate than Wikipedia due to the latter’s insistence on unreliable Reliable Sources. Heinlein became one of the first science-fiction writers to break into mainstream magazines such as The Saturday Evening Post in the late 1940s. He was one of the best-selling science-fiction novelists for many decades, and he, Isaac Asimov, and Arthur C. Clarke are often considered the “Big Three” of science fiction authors. He was one of the first science fiction writers to break into mainstream magazines such as The Saturday Evening Post in the late 1940s. He was one of the best-selling science fiction novelists for many decades, and he, Isaac Asimov, and Arthur C. Clarke are often erroneously considered to be the “Big Three” of science fiction authors.. The original “Big Three” were actually Heinlein, Asimov, and A.E. van Vogt. This is what winning the cultural war looks like. Getting the facts straight one at a time. He was one of the best-selling science fiction novelists for many decades, and he, Isaac Asimov, and Arthur C. Clarke are often considered to be the “Big Three” of science fiction authors, however the inclusion of Clarke is erroneous. The original “Big Three” were actually Heinlein, Asimov, and A.E. van Vogt. Proving that you’re never too old to learn, while I knew Heinlein, Asimov and van Vogt were Campbell’s top writers in the 1940s, I couldn’t recall ever hearing them referred to as the Big Three, whereas I had often heard that term applied to the trio named by the Wikipedia. (Michael Moorcock wrote that Clarke was one of the Big Three in an article published just this month.) Was the Heinlein/Asimov/Clarke identification really “erroneous”? I have to admit that seeing Infogalactic’s cited source was a John C. Wright essay from 2014 made me want to check further before accepting the information. Google led me to the Fancyclopedia (1944). Originally, “the Big Three” was a label 1930s fans applied to the three dominant prozines. Obviously at some later point they also endowed it on three sf writers. When did that happen, and who were the writers? There was no question that by 1949 I was widely recognized as a major science fiction writer. Some felt I had joined Robert Heinlein and A.E. van Vogt as the three-legged stool on which science fiction now rested. As it happened, A.E. van Vogt virtually ceased writing in 1950, perhaps because he grew increasingly interested in Hubbard’s dianetics. In 1946, however, a British writer, Arthur C. Clarke, began to write for ASF, and he, like Heinlein and van Vogt (but unlike me), was an instant hit. By 1949, the first whisper of Heinlein, Clarke, and Asimov as “the Big Three” began to be heard, This kept up for some forty years, for we all stayed alive for decades and all remained in the science fiction field. But Infogalactic, unfortunately motivated by a need to get in a jab at the Wikipedia, has oversold Wright’s argument and missed a chance to be really accurate. The truth is that both trios were “the Big Three,” each in their own era. This entry was posted in Reference Director! and tagged Arthur C. Clarke, Fancyclopedia, Infogalactic, Isaac Asimov, John C. Wright, Michael Moorcock, Robert Heinlein, Vox Day, Wikipedia by Mike Glyer. Bookmark the permalink. @clif: the question is who were called the Big Three \then/, not now. But he is certainly above average. The Infogalactic entry is bizarre in its prescriptiveness. The “Big Three” are whoever fans took to calling the “Big Three”. It is not “erroneous” to say that Clarke was the third member of the “Big Three”, because in common fan parlance for decades he has been referred to as such. The possibility that van Vogt was his predecessor in that trio some seventy years ago doesn’t mean that Clarke’s inclusion in the more recent formulation of the term is incorrect. Making a big deal out of asserting that the “Big Three” is REALLY Heinlein, Asimov, and van Vogt and not Heinlein, Asimov, and Clarke, is the sort of dickish thing that makes people in the con suite move away from you to find another conversation, leaving you to be “right” all by yourself. I wish I could find that website that gathered together all of Astounding/Analog’s “Analytical Laboratory” info…. Looking back at the quality and sheer number of their stories from the ’40s, the Big Three should be Lewis Padgett, Lawrence O’Donnell and C. H. Liddell. How about Le Guin, Russ, and Tiptree? !